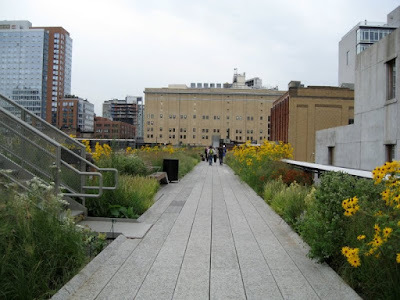 On Saturday afternoon, I had the pleasure to walk the new High Line on the west side of Manhattan. I was with my great friend Tom, a man who knows the history of Manhattan with a thoroughness that's as impressive as it is engaging. It was a treat to see the new park and it was an even greater treat to hear the story of the area told with affable manner of a man who's in love with where he lives. Anyhow, it was a pretty dreary day and in looking over my photos, they didn't do it justice. But thanks to Flickr, somebody else's will do the job far better than mine can. 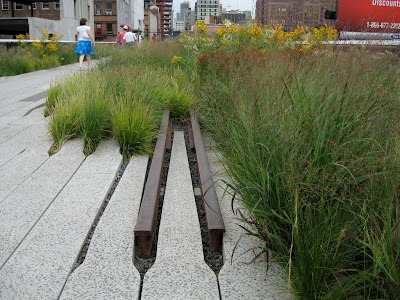 I first learned about the plans to turn the High Line Railway into a linear park in about 2004. 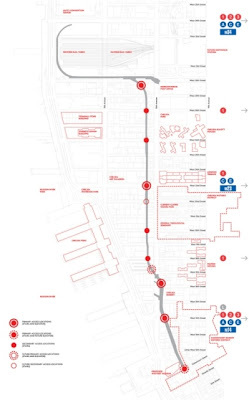 I was in New York to see the new Museum of Modern Art building and there was a whole gallery on the first floor of the new MOMA dedicated to the architectural plans for the new park. 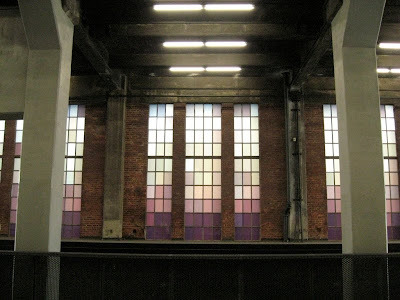 They were enchanting and ambitious plans to turn an emblem of west side urban decay into an asset unique in the world. 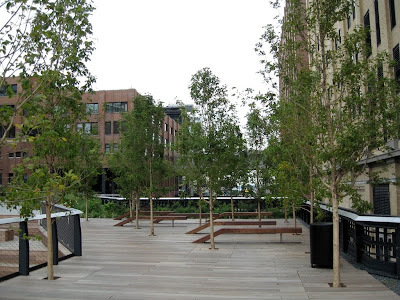 The High Line railway was built in the 1933 and it's an elevated railway that runs from the freight yards on 34th Street and follows 10th Avenue to the wholesale grocers in the meatpacking district at Gansvoort Street. 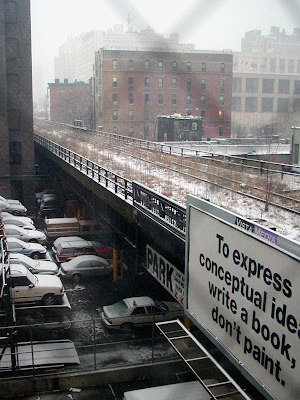 The last train ran down the High Line in the early '80s and it sat abandoned for 20 years. During those 20 years, it was cordoned off and allowed to go fallow. In time, the rail bed sprouted grasses and wild flowers and eventually, small trees. 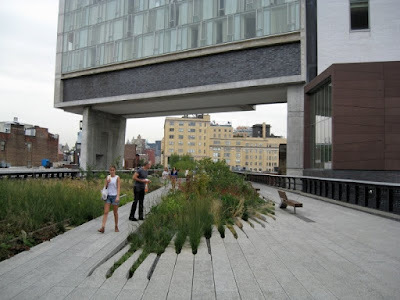 One of the final acts of the Giuliani adminstration was to set in motion the eventual destruction of the High Line, much to the horror of a group of preservationists called the Friends of the High Line. With the end of the Giuliani years came the new, High-Line-friendly administration of Michael Bloomberg. 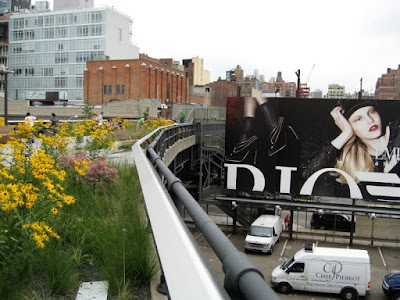 The Friends of the High Line had been raising private money to preserve the High Line for years and with the blessing of the Bloomberg administration, the transformation of the High Line from decaying relic to shining asset began. The park's been described as an urban meadow and it's a perfect description. It sits about 30 feet above the street and as soon as you walk up the ramp and step onto the High Line, the smell hits you. It's the sweet, grassy smell of being in the woods. 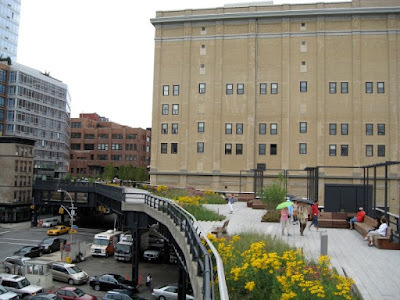 It's a total disconnect, because you're surrounded by the warehouse and water tank views of the meatpacking district. The park itself is a graceful, meandering path and it's easy to forget where you are. But every once in a while you turn a corner and to the northeast looms the Empire State Building and it throws everything back into context. 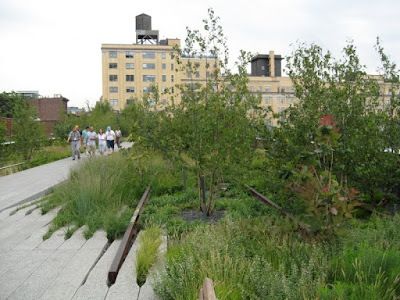 Prior to the construction of the new walkways, the Friends of the High Line hired biologists to catalog the plants that had grown over the tracks naturally. They collected seeds over the course of two years and cultivated them. 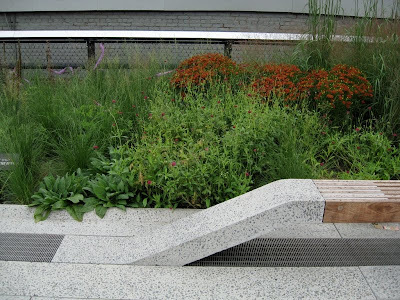 The landscaping in the finished High Line is a naturalized, balanced mix of native grasses, wildflowers and small trees. It's pretty cool to think that most of the plants there now are the descendants of the pioneer weeds that took over the place to begin with. The park meanders through neighborhoods and through actual buildings at a couple of points. It's a surprisingly quiet respite in a city not known for providing very many of them. 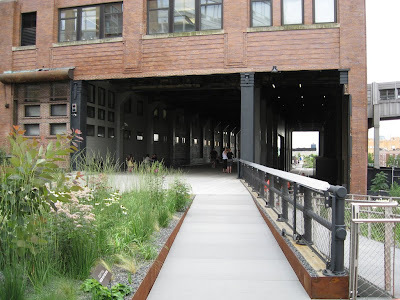 If you find yourself in the Greatest City on earth, head west on 14th Street and pick up the High Line. Read the background on this art installation here. Thanks Brenda, how can one NOT have a great time in New York?